I eat so much beef and chicken (and the occasional pork) that I try to remind myself to eat fish every so often—for variety if nothing else. I’ve never liked fish much, except when it’s battered and fried, so it really is something I have a hard time remembering to build into my meal plans. 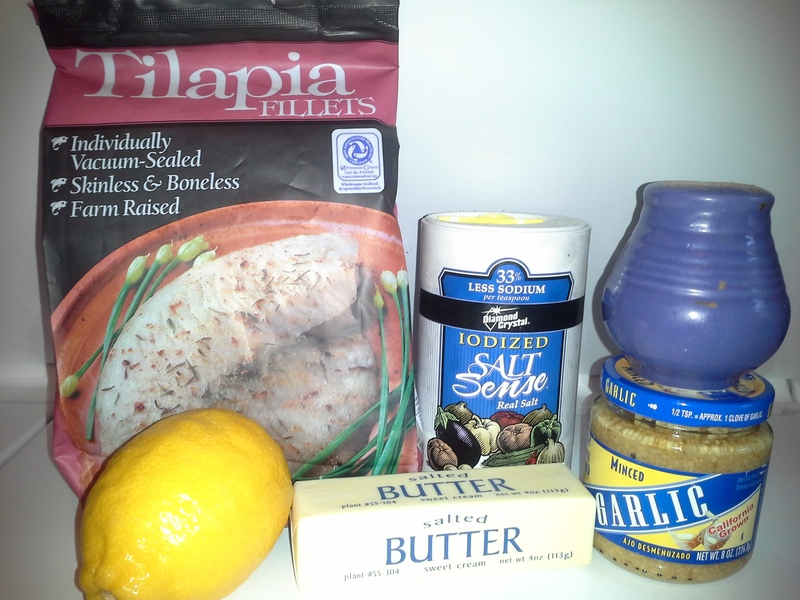 Typically, I’ll get tilapia when it’s on sale because it’s very mild and easy to cook. I will occasionally spurge on salmon (but only when it goes on sale for less than $6/pound). Since I had tilapia in the freezer, I figured today was as good a time as any to make a fish dish. Preheat oven to 400°F (toaster oven: 450°F). Baking dish large enough to fit fish fillets with plenty of room—I used a 9×9-inch disposable pan (does that surprise you at all?). Rinse and pat dry thawed fillets. Season lightly with salt and pepper. Slice lemon into 9 paper-thin slices and arrange in a single layer in the bottom of the baking dish. 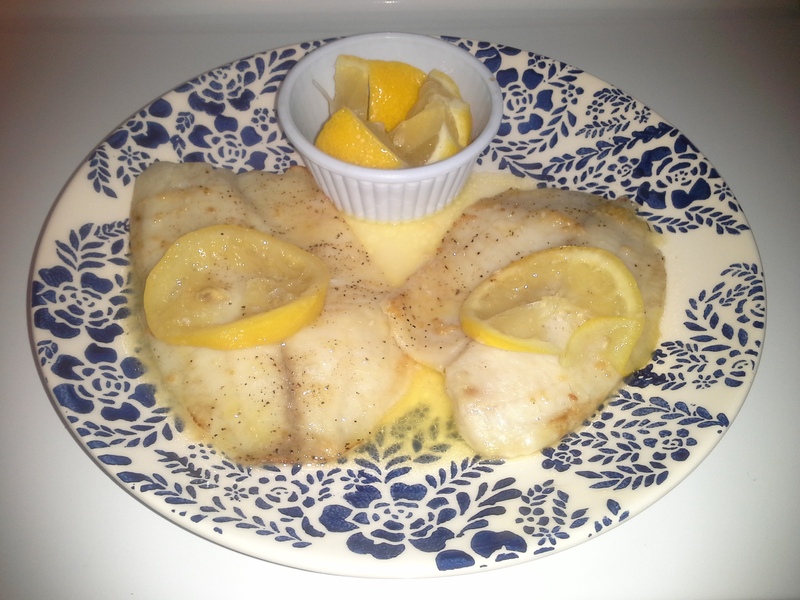 Place fish fillets on top of the lemon slices. Stir minced garlic into the melted butter and drizzle over fillets. Bake 15–20 minutes until fish is white through and flakes easily. Serve drizzled with lemon-garlic-butter from pan. This sounded like a great idea, and an easy way to infuse flavor into a relatively flavorless fish. Unfortunately, part of the flavor that infused into the fish was the bitterness from the skin of the lemon. But, this may just be me, as I am overly sensitive to bitter flavors. Next time I do this, I’m going to save myself time and just use a couple of teaspoons of lemon juice along with the garlic-butter before baking. Some lemon varieties have more bitterness in the skin than others. Lemon juice would be better, though, I agree. Like Scampi.